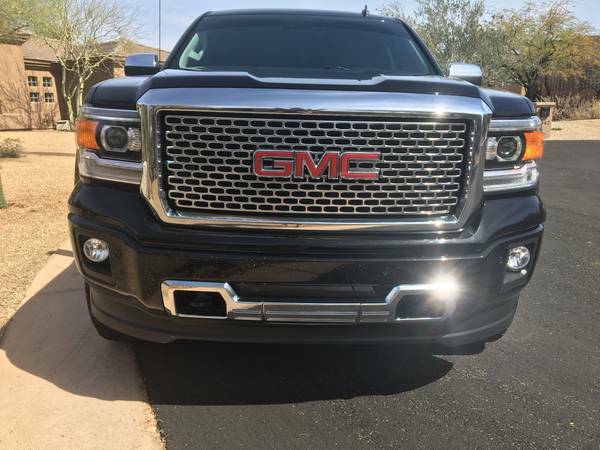 2014 GMC Sierra Denali 1500 pickup truck with 6.2L motor (420hp 460lb torque) and 50,635 miles, Black with Black Interior with many factory options including Air Conditioned and Heated Seats and Steering Wheel and Bose Sounds System. Aftermarket options include: Leveling Kit, Fuel 20" Rims and 33" Nitto All Terrain Tires, Rancho Shocks and Rear Airbags, Inyati Bed Liner and Tinted Windows. I bought a new truck and need to sell this one that I purchased in October 2015. Private Party Sale with Clear Title for easy sale. Please give me a call with any questions.